M takes his role as a member of the Frugi Family, very seriously. We were recently asked to make a selection from their awesome 2015 Christmas collection and M went for a cosy Hedgerow Hoody £32 with a truck and Christmas tree design on the front. 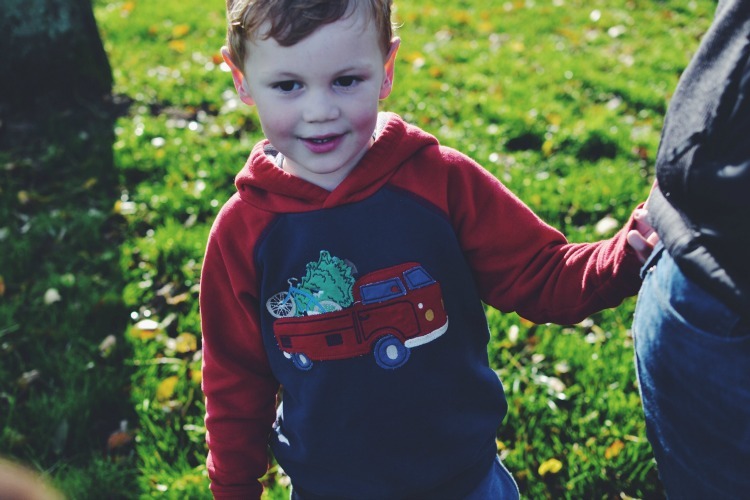 The little dude was keen to test his new hoody to the max and what better way to test it, than on a trip to the park. The Hedgerow Hoody is made from soft organic cotton and has a lined hood and ribbed cuffs. Our little guy is a little taller than average, yet size 3-4 fits him comfortably. 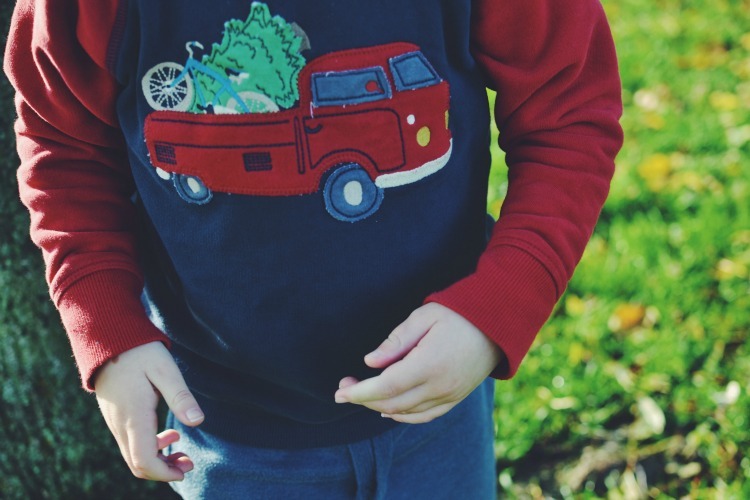 Kids love to be comfortable and have room to move, when it comes to clothes and Frugi ticks both boxes. 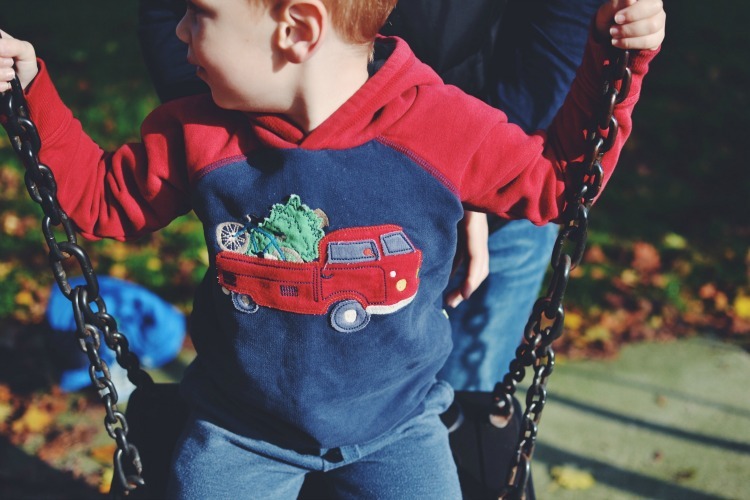 The Hedgerow Hoody not only meets M’s requirements, it also ticks all the parent boxes as it keeps our little man warm, is not tight to put on over the head and washes well. The great thing about Frugi clothing is how well it lasts despite the bumps and tumbles it takes. Over the last year we have been so blessed to receive various items of Frugi clothing and every piece looks brand new, like the day we received it. Not only is this great for future siblings, we are also able to gift items M has grown out of, to his friends. Though Frugi may be a higher price point than we’d spend on monthly clothes purchases, they are perfect for birthday and Christmas presents. Plus you know that the money you spend is not only going on clothes that will last, it is also going to a company that believe in clothing your children in ethical clothing and who are striving to give back to the planet. As part of the Frugi Family, we are sending you on a little Christmas circle of fab reviews of the awesome Christmas range. For more information on posts of this content, please read our Disclosure Policy. He looks very handsome in his jumper! Simply fab rugged kids clothing with great designs. Frugi are exactly what they should be and we love them too. 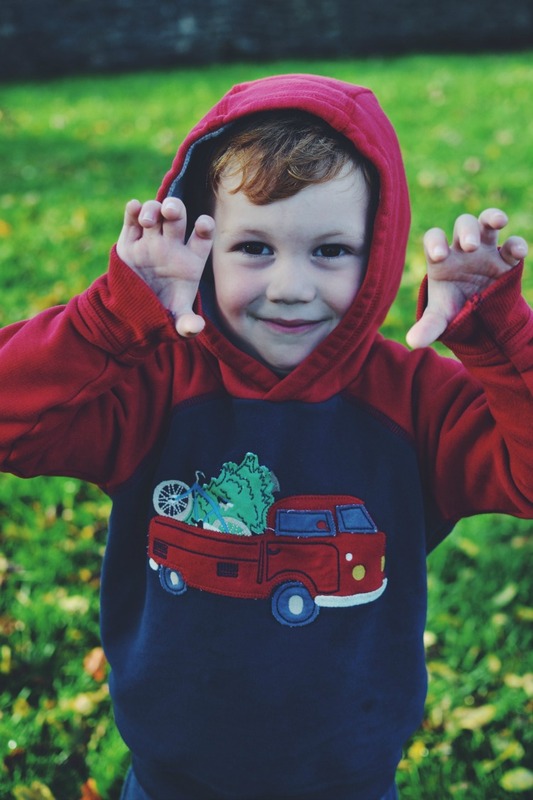 Ah he looks so warn and comfy in his hoody – glad it’s got plenty of room to move in… perfect for the park. I’m loving that hoodie – it looks perfect for autumn and winter and super cosy. Great choice.